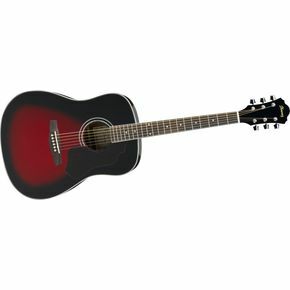 The Ibanez SGT120 Sage Series Acoustic Guitar offers an eye-popping appearance at a price that will keep you smiling. The SGT120 is aesthetically a throwback to the days when the details of a guitar were nearly as important as the guitar itself; a piece of artwork that looks just as good on the wall or on a stand as it sounds when you are playing it. For the collector of interesting guitars, this model will make a great addition, though there are other models that play better. While guitar reviews do not generally rate the lower-priced Ibanez guitars very highly, this one can be considered a good value simply on its appearance. It will make an impression whether you are playing in a small group or on stage and will definitely have you standing out in the crowd. While the SGT120 has a laminate spruce top and mahogany back and sides which combine to give it a nicely warm and well-rounded tone, it tends to get a bit tinny on the higher treble notes and is not well-adapted to fingerstyle playing. The fingerstyle player will find that this guitar tends to sound mushy, and without the clarity of other models. One other concern is that the SGT120 also has issues staying in tune for very long and needs continual adjustments. Jasmine by Takamine S35Q Quilted Maple Dreadnought will give you a quilted maple dreadnought acoustic with a solid spruce top for exactly the same price, and with a brighter, clearer tone than the SGT120. But of course the Takamine does not come with the really cool paint job that makes the SGT120 such a popular choice. Whether you are looking for a blue guitar, red guitar, black guitar or natural guitar, the SGT120 will not disappoint with all these color options!